With Memorial Day weekend comes the traditional kick-off to cooking out and barbecue season. Although it’s always cook-out season in the South, it was a rougher than usual winter and it’s good to know that outdoor activities and barbecue are in full swing. At some point in the ‘90s, when my job was frequently moving me around the country, I gave away my barbecue grill. Now, two decades later, I still haven’t replaced it. That was not necessarily the plan. I gave the grill away so I wouldn’t have to move it anymore and I had every intention of replacing and upgrading it when I got settled in a new place. Now, even though I still think about purchasing a new grill (I’m attracted these days to the Big Green Egg) I am in no rush. My standard line is that I can find much better barbecue than I make so why would I want to take the time and trouble to grill my own? I’m a pretty good cook, it’s true. But I know many people who grill and barbecue better than I. When it comes to barbecue, I prefer to be a connoisseur rather than a master. I once toyed with the idea of pursuing Kansas City BBQ Society judge certification but after exploring the rules I realized I prefer to consume barbecue as an amateur. Over the years, I have found some prize-winning barbecue to be lacking and the barbecue that breaks all of the rules is sometimes among the best. In other words, I’m not that interested in measuring the smoke ring and analyzing if it “pulls” properly or “falls” off the bone; I’m not interested in quibbling over what’s authentic barbecue and what is just grilled meat. I’m interested in how it tastes and makes me feel. As I write this, I am still in the afterglow of a quick stop at the original Dreamland location in Jerusalem Heights, Tuscaloosa. Driving away from that storied place, I realized that one of the things I love most about Dreamland is that slight glorious burn from the sauce that lingers in the front of the throat for a good hour or so after the meal is done. I can give a long and ever-evolving litany of good barbecue joints around the country and I have been to quite a few. But some of the best and most fondly remembered barbecue of my life was cooked in the backyard by my father, Grover Journey. Dad usually fired up the grill on Memorial Day, Independence Day, and Labor Day. He would start gathering his meat – pork ribs, sausage, and chicken – a couple of days in advance. He was picky about his meat choice. Mother would prepare traditional sides in the kitchen and I often made a huge green salad loaded with chopped vegetables. My dad, who smoked cigarettes for about 50 years, has COPD – emphysema – now and as his breathing problems got worse he eventually stopped cooking at the barbecues. If the family is together for a warm weather holiday, my brother sometimes serves as pitmaster. Other times, we just buy meat and the sides at a local joint. But when Dad was younger and healthy, he preferred to do the cooking himself. On the few occasions when I asked him to show me how he did it, he was never particularly forthcoming. I think he grilled his meat by instinct and it would have disturbed his mojo to divulge too much. I get that. I am much more comfortable handling my kitchen and my cooking alone; when I have “help,” things begin to go awry. One thing I do know: Dad’s technique broke the rules. I read and watch what other pitmasters say and I realize that my father’s way didn’t conform with conventional ‘cue wisdom in many aspects. Having said that, it always had a phenomenal taste so, in this case, rules be damned. With the approach of Memorial Day, I recently decided to make another effort to pry loose any of my father’s grilling secrets. I chose to make it part of a recent dinner conversation. “Dad, what did you use to marinate your meat before you’d barbecue?” I asked innocently. “I didn’t marinate it,” he said. “I thought I remembered some kind of pre-soak or marinade you used to do,” I responded. He denied it. My mother and I both seem to recall that he would pre-soak the meat in apple cider vinegar but memory is a tricky thing. This exchange sort of stopped my query cold. Later that evening, I ventured forth and asked him a little bit more about his technique. I asked him what sauce he used because I remember that he would use store-bought sauce as a base. But in my memory (there’s tricky memory again) he used the bottled sauce as a base only and added his own ingredients to it. Once again I hit a wall. He told me that he always used Kraft “Original” Barbecue Sauce. “Oh… Okay.” I usually know better than to push on at these moments. And since I didn’t pursue it, Dad volunteered a good bit of additional information. He said he liked to cook over low heat for several hours. This is the way I remember it, too. He would start early in the day (but did not pull the all-nighters that some pitmasters swear by). The stealthy aroma would waft over the neighborhood until the wait was almost too much to handle and it would seem like the time to sit down and eat would never come. Dad would sit patiently in a lawn chair, armed with tongs and a spray bottle of water to hit the flames when they flared up. I think the water in the bottle may have been spiked with apple juice but I dared not bring it up in that recent Q and A. Dad mentioned that he liked to mop some sauce on the meat at the beginning before he put it on the grill. This is one of those areas where many of the “experts” would disagree but I remember it as part of his technique and am a witness that, in my dad’s case, it worked splendidly. He would continue to mop sauce on throughout the cooking process as he turned the meat over. And he liked to turn the meat a lot (I know, I know – breaking the rules but it worked). As the various meats were finished, he would pile them on platters, wrap them in aluminum foil, and send them in the house to rest. 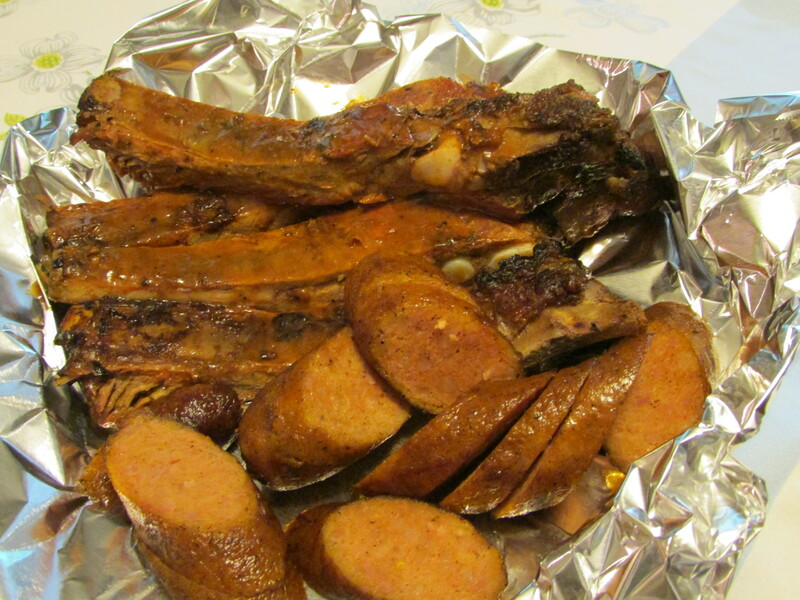 Huge platters of pork ribs, chicken, and sausages would line the kitchen counter along with Mother’s sides. They always cooked several times more food than was needed for the meal. I counted on it; I liked to be able to carry barbecue leftovers home. Once, my sister-in-law’s grandparents were visiting from California and joined us for Labor Day barbecue. Spotting the spread, Buster, the grandfather, exclaimed at all of the food. “Do you always eat like this?” he spurted. “Every single day,” my dad playfully shot back in a dead-pan lie. All of that sauce slathered on gave the meat a flavorful black char — the bark. The meat was always moist all the way through and never tasted burned or overdone. Even those who considered themselves wizards at the grill were always impressed by my father’s barbecue. He broke the rules and did it up right. I’m pretty sure I’ll never get the low-down on the specifics of his technique. This entry was posted in barbecue, memoir and tagged Alabama barbecue, Big Green Egg, Dreamland BBQ, Grover Journey, Kansas City BBG Society, Kraft Original Barbecue Sauce on May 24, 2015 by gedwardjourney. What a great story!! And we agree with your perspective. “Rules” (especially barbeque rules) are made to be broken. Even though the Ol’ Miner is KC certified judge, we’ve seen him flaunt the rules outrageously and come up with GREAT food. We’ll bet you never get the low down on your Dad’s methods either, but we can tell by the way you write that he taught you well anyway! !